Even in Hochiminh, a chaotic and highly density city, a 3 m wide and 9 m deep plot in a narrow street is still considered as a thorny problem for renovating an old house to a more comfortable and functional space. The house is designed for a middle age woman and her friend, who are inspired by music and beauty of nature. The modesty and cleanliness are the first impressions of the house look. Horizontal louvers embellished with some flowers give distinction but not strange to its exterior in compare with neighbours. The ground floor seems to be larger and tidier because of the combination of living room, dinner, and kitchen without any partitions to define the spaces. The familiar materials such as bricks and steels are used flexibly to add raw feeling to these man-made spaces. Moreover, nature is delivered into the house by the introduction of a tree right at the entrance. This tree, as a living body, not only softens rough sides of the design but also connect the ground space to the upper space. The second floor with the same language is the space where bedroom and toilet are located, emphasize the rich of daylight due to its openness to the sky. The connection between bedroom and toilet is collection of sparse wooden pieces, which cause flows of light, wind, rain and even human intentions among the house. This is also the place where the tree meets its need for sunlight. 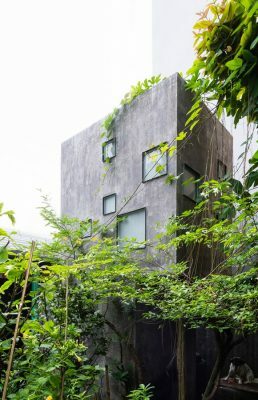 Thus, it can be said that nature is skilfully to any corners of the house by creating “connecting space” which bridges and adjusts the difference domains and places, from outside to the ground floor and the second floor before being back to outside through the roof opening up to the sky.